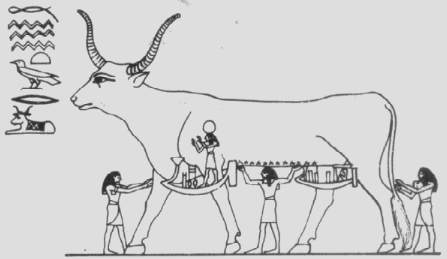 Description: Goddess of infinite space; Mother of the sky and the sun; Celestial Cow; Heaven's Ocean; She along Whose belly Ra proceeds each day in his solar bark; Protectress of the dead. To Whom Sacred: lotus of the world; cow; Methyer (Greek name for Heaven's Ocean); the number 18; the stomach (in canopic jars). Male Associates: son/brother/consort, Anhur, He-who-brought-back-the-far-off, or Support-of-the-heaven, god of war. As protectress of the dead She is associated with Isis, Lap-of-Power. Geography/Culture: Egyptian. Worshipped at Bubastis. Male Associates: consort, a lion, (worshipped at Leontopolis), identified with Anhur. See also Maftet, Lady-of-the-Castle-of-Life, (Who is linked with Ubasti, She-of-the-City-Bast), a lynx Goddess. She seems to be confused with Sekhmet, Powerful-One, or perhaps Mai-Hesa, Fierce-Eyed, is an alternate name for Her. Alternate name for, or identified with Tefnut, Dew-of-Dawn. Ubasti, She-of-the-City-Bast, is also worhispped at Bubastis. Source: Ions EM 46, 125.
worked on: September, August, June 1995; August 1991.